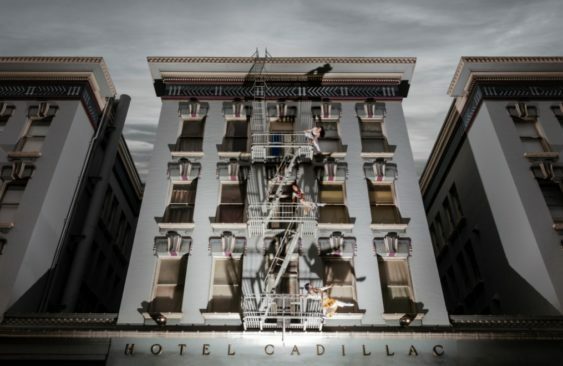 In partnership with the Tenderloin Museum, Flyaway Productions presents the world premiere of Tender (n.): A Person Who Takes Charge, a site-specific aerial dance celebrating 100 years of “outcast activism” in the Tenderloin. Tender runs June 7 – 16, 2018 at the Cadillac Hotel, located at 380 Eddy Street with multiple performances over the course of the ten days. All performances are free, as is admission to the Tenderloin Museum (normally $10), located on the ground floor of the Cadillac Hotel, during each performance. The dance takes a historical lens on both the isolation and stamina that have impacted the Tenderloin over the last 100 years. It celebrates the outcasts who have defied convention here and the unlikely activists who have sought, in almost every decade, to create a desirable place to live and thrive. The Right to be Believed will give spectacular language to a serious sociopolitical issue that has not been carefully examined since Anita Hill challenged Justice Clarence Thomas in 1991. This site specific dance explores the lack of credibility for women that is simultaneously a legal, social, and economic problem. The Right to be Believed will use flight, inversion and a defiance of gravity to subvert limitations, to delight in the body despite unjust constraints, and to claim public space as a proving ground for women to be taken seriously in the nation’s collective imagination. Bring your own blanket or a lawn chair and join in for a spectacularly powerful performance.